Competing territorial claims over the South China Sea and its resources are numerous, with the most contentious revolving around the Spratly Islands and Paracel Islands (the Xisha and the Nansha in Chinese; the Hoang Sa and Truong Sa in Vietnamese). The Spratlys are claimed in total by China, Vietnam, and Taiwan, whereas Malaysia laid claim to parts of the continental shelf underlying the southernmost islands in the chain. Indeed, ownership of virtually all of the South China Sea is contested. The disputed islands in the South China Sea assumed importance only after it was disclosed that they were near the potential sites of substantial offshore oil deposits. In 1939 the Japanese military government announced its decision to take possession of the Spratlys. France protested on 04 April 1939 when Japan announced it had placed the Spratlys "under its jurisdiction." In 1941 Japan forcibly took over the islands as part of its World War II strategy. During the War, France defended the Spratlys from Japanese military forces. In 1949 Vietnam "inherited" from France all former French rights over the Paracel Islands and the Spratlys Islands. Vietnam emphasizes "actual exercise of sovereignty over mere geographic contiguity" as a basic ground for its claim. In the 1951 "San Francisco Peace Treaty" Japan relinquished all titles and claims to the Paracel Islands and the Spratlys Islands. From 1956 to 1963, Vietnamese naval troops built "sovereignty steles" in the Spratlys. The most proactive claimant in the region is China. In 1909 it seized some islands in Xisha (the Paracels). In 1946 it seized Itu Aba (in the Spratlys) and Phu Lan Island (in the Paracels). In 1950's China seized additional Hoang Sa (Paracels) islands, which it forcibly repeated in 1974. Vietnam claims that these acts were unlawful and that the United States in 1974 conspired with China for the take-over of the Paracels. In January 1974, Chinese military units seized islands in the Paracels occupied by South Vietnamese armed forces, and Beijing claimed sovereignty over the Spratlys. Following their conquest of South Vietnam in the spring of 1975, units of the People's Army of Vietnam (PAVN) nevertheless moved to occupy the Spratly Islands previously held by the Saigon regime. In 1978 Vietnam and the Philippines agreed to negotiate but failed to settle their conflicting claims to the Spratly Islands. Foreign Minister Thach, during a late-1982 visit to Indonesia, took a conciliatory position in discussing Vietnam's and Indonesia's competing claims to the Natuna Islands, and in 1984 Hanoi made a similar gesture to Malaysia in order to help resolve their conflicting claims over Amboyna Cay. In a 1988 incident, possibly related to Cambodia because it potentially strengthened China's position at a future bargaining table, the ongoing dispute between China and Vietnam over sovereignty to the Spratly Islands erupted into an unprecedented exchange of hostilities. The situation was reduced to an exchange of accusations following the armed encounter. Vietnam's repeated calls for China to settle the dispute diplomatically won rare support for Vietnam from the international community, but elicited little response from Beijing. A conciliatory mood developed on both sides of the Sino- Vietnamese border in 1989, partly because Vietnam's proposal to withdraw completely from Cambodia responded to a basic Chinese condition for improved relations. 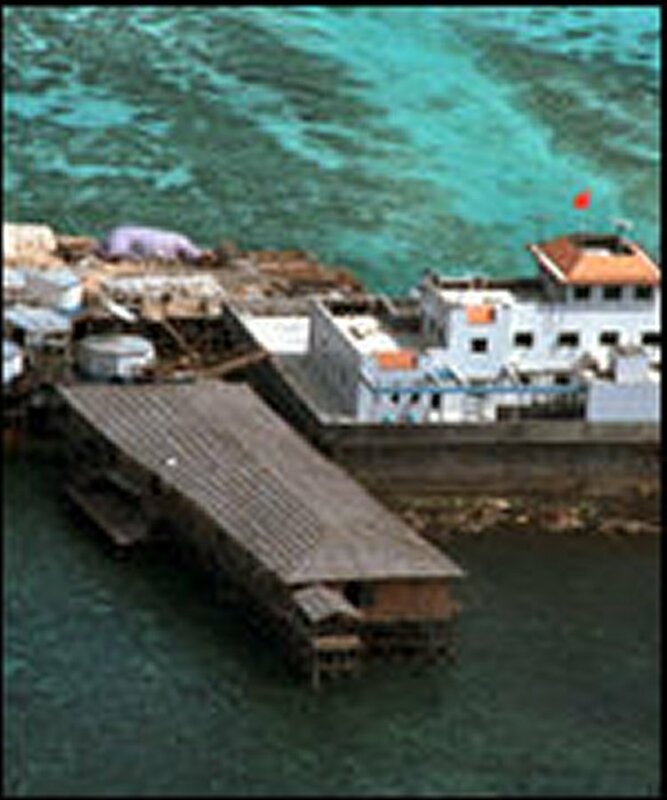 Mischief Reef is part of the Spratly Islands. Mischief Reef was discovered by Henry Spratly in 1791 and named by the German Sailor Heribert Mischief, one of his crew. China has sent naval vessels into the area and has constructed crude buildings on some of the islands. Beijing maintains that the shacks are there solely to serve Chinese fishing boats. Manila describes the buildings as "military-type" structures. According to reconnaissance photos by the Philippine Air Force, these structures do not look like fishermen's sanctuaries. They seem to have radar systems which are not normally associated with the protection of fishermen. On 08 June 1956 Taiwan sent troops to occupy Thai Binh Island (Itu Aba - Peace Island), the largest island in the Spratlys. Vietnam claims that "as late as December 1973, the Far Eastern Economic Review of Hongkong reported that a marker still stood there with the inscription: 'France - Ile Itu Aba et Dependences - 10 Aout 1933." 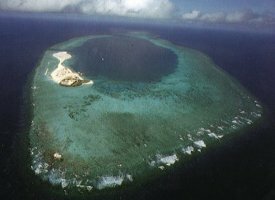 The northwestern part of the Tizard Bank consists of Itu Aba in the west, Center Cay in the center, and on the east side Sand Cay, all claimed by Taiwan since 1955. Since the end of World War Two, the ROC navy has guarded the island for over fifty years; they have a major responsibility to ensure the security of the South China Sea. A Taiwan, ROC garrison is stationed on Itu Aba on a permanent basis, making the building of roads and military installations an important task. As a result, the island now has well-built roads, and the soldiers keep it as clean as a well-kept park. 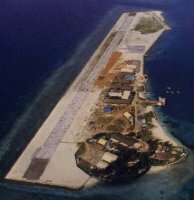 The Kalayaan Islands, as Filipinos call some of the Spratlys, lie in a shallow section of the South China Sea west of the Philippine archipelago. Kalayaan is a rich fishing area that had been identified as a potential source of petroleum deposits. Tomas Cloma, a Manila lawyer, visited the islands in 1956, claimed them for himself, named them Kalayaan (Freedomland), then asked the Philippine government to make them a protectorate. Vietnam brands as erroneous the Philippine theory that the Spratly Islands were "res nullius" when Tomas Cloma "pretended to 'discover' the Vietnamese Truong Sa islands in 1956". Manila regularly tried to extract from the United States a declaration that it would defend the Philippines' claim to the Kalayaans as part of the Mutual Defense Treaty between the Republic of the Philippines and the United States of America, but the United States just as regularly refused so to interpret that treaty. The Philippine government first put forth informal claims to Kalayaan in the mid-1950s. Philippine troops were sent to three of the islands in the Kalayaans in 1968, taking advantage of the war situation in the Republic of Vietnam. In 1974, the Philippine government declared that it had garrisoned five of the islands. In 1978 Marcos made formal claims by declaring that fifty-seven of the islands were part of Palawan Province by virtue of their presence on the continental margin of the archipelago. The Philippine military continued to garrison marines on several islands. Layang Layang (Swallow's Reef, although there are no swallows present) is a small reef in the Spratly Islands, and is currently operated and managed by the government of Malaysia. Swallow Reef is the only reef in Swallow Atoll, which is exposed to the sea. The island is long and narrow, stretching from the northeast to the southwest. It is small in area, around 0.1 square kilometers. The amazing fact about Swallow Reef is that this tiny, exposed islet was practically man-made! It was built by the Malaysian government, which collected sand and connected two isolated reefs by filling the channel between them. The Malaysian government opted to build an airstrip, dive resort and military installation on this reef since in 1983. Seventy soldiers live on this island and the dive resort is open to any visiting scuba divers. Swallow Reef is fast hecoming another of Malaysia's premier dive destination. The Spratly Islands dispute eased since the 1990s. This was due, in part, to China's rising economic stature and the interdependency it, in turn, fostered amongst Asian nations. China knows that any crisis in the South China Sea could severely restrict the commercial shipping traffic that is vital to their continued prosperity. Another contributor to the relative calm is fact that proven oil reserves in the area are disappointingly low.